The Oconee County Board of Commissioners, in a 3-1 vote Tuesday night, agreed to spend $13.4 million to upgrade the Calls Creek wastewater treatment plant to 1.5 million gallons per day and prepare the plant for possible future upgrade to 3.0 million gallons per day. Oconee County Utility Department Director Wayne Haynie argued that the county would save money in the long-run if it spent a $1.1 million “premium” on the plant now so that the county would have the option of upgrading the plant to 3 million gallons per day in the future. Commissioner Chuck Horton told Haynie he supported the 1.5 million gallons per day upgrade but wanted to limit the size of the plant on that site to that size. Commissioner Mark Thomas initially spoke about limiting the existing plant to 1.5 million gallons per day, but in the end only Horton voted against the expenditure of $13.4 million. Construction on the plant is expected to be completed in 12 to 18 months once construction starts. 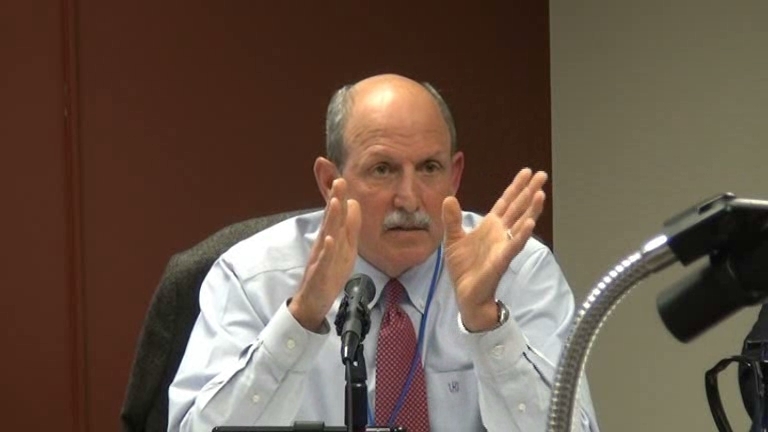 Haynie told the Board it was necessary to move forward with the plant expansion to deal with the “ticking time bomb” the county has before it because it has not expanded its sewage treatment capacity to keep up with demand. He recommend that the Board award a contract for $13,383,491 to Crowder Construction Company of Conyers as a guaranteed maximum price for construction of the plant. The Board of Commissioners had awarded Crowder a $440,000 contract last February to do the design work for what was then estimated to be a $6.7 to $7 million upgrade of the Calls Creek plant. In the meantime, the county has changed its plans several times and, in March of last year, asked Crowder to include just less than $2 million in added components to the design. The key part of the March design change was a second clarifier, but also added were new piping, a splitter, and other facility modifications that would be needed should the plant be expanded to 3 million gallons per day in the future. In response to questions from Horton, Haynie acknowledged that the changes he requested of Crowder to allow for possible future expansion of the plant added $1.1 million to the $13.4 million cost of the contract. Haynie said the new plant will require removal of trees and grading, and it would be best to grade for a larger plant at this time rather than in the future because of the possible need for blasting. He also said the second clarifer, which is used to remove solid particulates or suspended solids from liquid, would created some desirable redundancy in the plant’s operation. Haynie had not mentioned the need for redundancy in any of the earlier public discussions of the design, and a Crowder report on the project from Oct. 21 of last year referred to the design changes as needed for a possible upgrade to 3 million gallons per day. Six people spoke at the meeting last night, all in opposition to the decision to move forward with the $13.4 million expenditure. Michelle Momany, who lives along the creek, said the added features would be a temptation to future Boards to expand the plant beyond the 1.5 million gallons per day design rather than build a new plant on the Middle Oconee River, as has been proposed since at least 2005. Momany and others in the subdivisions along the creek have organized Friends of Calls Creek, which has opposed construction of a sewer pipeline down the creek. If the county expands the Calls Creek plant beyond 1.5 million gallons per day, it will be necessary to find a way to discharge the additional effluent in some other way than into the creek itself. The state has said the small creek cannot handle more than 1.5 million gallons per day of treated effluent. One option discussed in the past is construction of a pipeline down Calls Creek. Board of Commissioner Chairman John Daniell, who does not vote except in the case of a tie, spoke in favor of keeping open the option of future expansion of the existing plant, located on the north side of Watkinsville. Daniell, who took over the Chair in January, has shown himself to be willing to take strong stands on issues and to openly encourage the four voting commissioners to follow his lead. Daniell acknowledged that the action he was proposing was not popular with everyone. I was one of those who asked the Board not to approve the existing plans. I believe it is a mistake to bring such a high volume of untreated sewage to the small creek because of the possibility of spills. The county had a spill at the plant on Friday, which currently is permitted at .667 million gallons per day and receives about 400,000 gallons of flow on a normal day. In other action on Tuesday night, the Commission named 24 people to a Stakeholder Advisory Committee to help update the county’s Comprehensive Plan. That plan spells out preferred land use in the county. The 24 selected members include two citizens who currently serve on the county’s Land Use and Transportation Planning Committee, a member of the county’s Industrial Development Authority, and two members of the Planning Commission. The Stakeholders Committee includes nine women. The selected citizens are highlighted in the list available for download or viewing HERE. The Commission also voted to name Horton as a member of the Hard Labor Creek Regional Reservoir Management Board, from which he had been removed by Board vote back in December. The video below is of the entire meeting of the Commission. The discussion of the Calls Creek sewage plant expansion begins at 19:05 in the video. OCO: BOC 2 7 17 Complete from Lee Becker on Vimeo. How did that sewage plant get so expensive and why was it not put out for bids? The way to handle inadequate sewer capacity is to stop issueing building permits. heart breaking and devastatingly far-reaching decision that costs the county so much on so many dimensions...simply to fatten the wallets of developers and those in their pockets. the boc should be ashamed of this vote and failing to assume responsibility by working with athens-clarke county while beginning the middle oconee plant. it is also appalling to see the tail (haynie) wagging the dog (the boc)...in spite of haynie's repeated displays of total incompetence and lack of regard for our beloved county. The county received four bids in 2016 in response to a RFQ for the design-build contract for the sewer plant. Crowder was one of the bidders and was given the contract, which meant that it was to design the plant and then build it for a guaranteed maximum price that it set. The price increased in part because the county changed the plans, but it also increased as Crowder did the design work. Haynie has said that the initial estimates were found to be inaccurate. Once the plant can be enlarged, the temptation will be too great to use that capacity and then the line down Call's creek will be inevitable, very sad. They really should have been looking forward to the Middle Oconee River plant and begun planning for that. Appreciate Mr. Horton's efforts to get the board to look forward and not take the easy path. He stuck to his word which is refreshing. Appreciate the willingness of the 24 citizens to do the work on the plan. It will take a lot of their time. Looks like a well balanced group. Glad they did not appoint Abe. Sure is a bunch of money all of a sudden. Estimates doubled in a year, and includes over a million for a "maybe." The Ticking Time Bomb has existed for well over a decade, and, as usual, not dealing with it will cost. Mr. Horton was wise to detail problems with the plan, and voted accordingly. One only hopes the Board is familiar with the eye-glazing details in the weeds. Did We Win, Lose or Tie? The Oconee County Board of Commissioners voted 3-1 approving funding $13.6 million for a new sewage treatment plant at the site of the current plant. The funding included $1.1 million to build out the new plant so that it could be more easily expanded to another 1.5 Million Gallons per Day at some future date. Commissioner Horton was the lone 'no' vote. With the great turnout of the Friends of Calls Creek, there was standing room only. Did We Win? Yes, we won. This fight, beginning nearly a year ago, was to stop an expansion of the Calls Creek Plant to 6.0 Million Gallons per Day and to stop a pipeline down Calls Creek. The vote last night approved an expenditure for a 1.5 MGD plant and a Calls Creek pipeline that dropped to a 3rd or 4th alternative status from a first place status. Did We Lose? Yes, we lost. The new plant is to be designed and fitted out with the necessary equipment and preliminary footings to be expandable in the future. Did We Tie? Curiously, we tied. We are in an excellent position, with committed FOCC'rs and information in hand, to fight another day - as many days as are needed. •In the longer term,we now have ample time to design well formulated business and legal cases to thwart a future expansion of the Calls Creek Plant. •Time to work toward a more ecological and economical water and sewage system for Oconee County. FOCC has its own Face Book page! Truly sickening! What a power grab. Thought we were going to have a change in this county! Here is the deal. Expand Calls Creek. Run discharge to Middle Oconee via the other right of way option (Ga Power line I think). Design and upgrade pump stations so NONE of our creeks gets a pipeline down them. If the Middle Oconee Plant is built, pump all raw sewage through well thought out pipeline routes and pump stations that preserve neighborhoods. Ask, why we are not working with Clarke? Simple answer is because Clarke will not work with Oconee. clarke would not work with melvin davis. oconee county could/should work with clarke county now. No, Melvin has nothing to do with it. Athens doesn't want to give any help to Oconee because of all the retail leaving Athens for Epps Bridge. Think about it... Why would Athens give Oconee an additional competitive advantage? Anon 8:39 am: It's about negotiation. Yes, Athens lost much retail to Epps Bridge, but there are hundreds of other areas the counties interact on. Athens and Oconee worked very, very closely during the Caterpillar negotiations. I had first hand insight into the process and both counties worked intensely under some tight and pressure filled deadlines. John Daniell and Jeff Benko need to step up. Athens has a brand new county manager who is receiving much praise for bringing needed change after Alan Reddish's long tenure. It's not "rocket science". This is about effective leadership and foresight. Spending tens of millions of dollars from Oconee residents is not the only solution. We're already in the hole $30-$40 million because of Melvin's gamble on the Hard Labor reservoir. Oconee for the most part has some very good department heads who can for the most part handle day to day operations. John Daniell and Jeff Benko make six figure salaries to solve and fix the long term, the macro, the big ticket stuff, and this is No. 1 on the list. Not rocket science is correct. However, don"t pretend it is easy! Some of your community upset about the refund and others about the upgrade to Calls Creek. And it is only related to your personal impact. But some how ACC will just jump on board with no regard to their personal impact. Wake up to how ridiculous people act.